In 1956, Cardinals rookie second baseman Don Blasingame sprayed singles to all fields, ignited the offense with stolen bases and was superb at bunting for base hits. With the bases empty, Blasingame bunted for 66 hits in 77 attempts _ an 86 percent success rate _ during his 12-year big-league career, according to research conducted by James Gentile of SB Nation. Of Blasingame’s 1,366 big-league hits, 1,105 (81 percent) were singles. 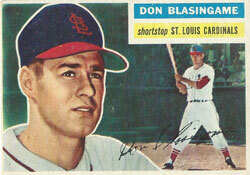 In five years (1955-59) with the Cardinals, Blasingame produced 663 hits, with 528 (80 percent) being singles. Blasingame got an opportunity to become the starting second baseman for the Cardinals because of a trade involving a fan favorite. In June 1956, the Cardinals dealt second baseman Red Schoendienst to the Giants, opening the position for Blasingame. In five games for the 1955 Cardinals after his promotion from the minor leagues in late September, Blasingame gave an indication of his electrifying potential. He had six hits and six walks in 23 plate appearances (a .545 on-base percentage). Cardinals manager Fred Hutchinson opened the 1956 season with Schoendienst at second base and Alex Grammas at shortstop, but after three games Blasingame replaced Grammas. Journalist Bob Broeg noted Blasingame wore uniform No. 3, the same worn from 1932-37 by Frankie Frisch, the Cardinals’ fiery Gashouse Gang second baseman who was elected to the National Baseball Hall of Fame. Blasingame said his playing style was inspired by Hall of Famer Ty Cobb. “I never saw him, of course, but I’ve read a lot about him, the way he could put the pressure on the other club and keep it there,” Blasingame said. Because of his throwing arm, the Cardinals projected Blasingame as a better fit for second base than for shortstop. One of the players general manager Frank Lane acquired from the Giants for Schoendienst was Al Dark. Blasingame replaced Schoendienst at second, with Dark taking over at shortstop. According to The Sporting News, Lane saw Blasingame “as a firebrand,” much like Nellie Fox, all-star second baseman of the White Sox. “It was evident he had a chance for future greatness if he could be placed at second,” Lane said of Blasingame. Nicknamed the “Corinth Comet” (he hailed from Corinth, Miss.) and the “Blazer,” Blasingame finished his rookie season with 153 hits in 150 games, with 72 walks and 94 runs scored. In his four full seasons (1956-59) with the Cardinals, Blasingame ranked in the top 10 in the National League in singles each year. In 1959, Blasingame led the league in singles, with 144, seven ahead of the runner-up, Reds second baseman Johnny Temple. Blasingame also ranked among the top 10 in the league in stolen bases for three consecutive Cardinals seasons (1957-59). The Cardinals, however, were last in the league in home runs in 1958 and sixth among eight teams in 1959. Desperate for power, Cardinals general manager Bing Devine traded Blasingame to the Giants for shortstop Daryl Spencer and outfielder Leon Wagner in December 1959.